Coriander microgreens nearly ready to eat... Photograph: Jane Perrone. I've come to a bit of a standstill this week: I don't know if it's the heatwave the UK has been going through, the pressure of making a weekly podcast or England's exit from the World Cup, but it's left me feeling rather weary. So I thought I'd dedicate this episode to some really quick and easy projects for indoor growers that take two to five minutes to complete, and (mostly) use items that you may well have in your storecupboard, or can be bought from your local market. It's nice to plan out and complete complex, high-maintenance indoor gardening, as per James Wong's brilliant projects in the last two episodes, but sometimes it's great to do something that's what I call a 'quick win'. It's all very well to dream of growing all your own herbs from seed, but let's get realistic - we all buy supermarket herb pots from time to time. They don't tend to last very long in the kitchen because the seedlings are shoved together in a tiny pot and are usually potbound before you even buy them. The key to solving this problem is to spend a couple of minutes pulling the herb rootball out of its pot, teasing apart the herbs into small clumps and potting up in individual pots. Place them in a bright spot and water thoroughly - you'll find your plants last way longer and will grow on to become bigger plants. Lemongrass - Cymbopogon citratus - is a lovely addition to all kinds of dishes but is specially good for Thai food. 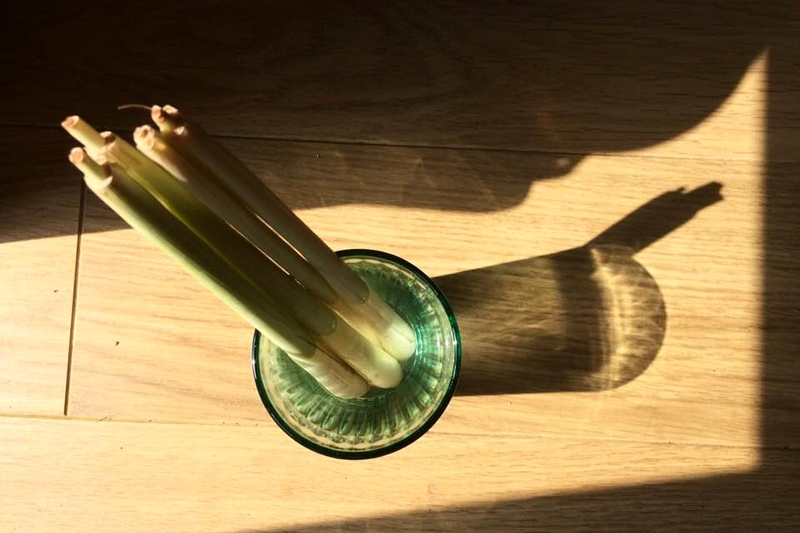 It's fairly easy to get hold of stalks of lemongrass, and they are incredibly easy to root in water to make your own lemongrass plant. Try to buy stalks that haven't been processed too heavily - in other words, the base of each stalk should be intact. This is important because this is where the roots will grow from. Drop the stalks into a glass of water, leave it in a warm bright spot, and roots will start to form within days. Once the roots are a few centimetres long, the stalks can be planted in houseplant compost, each one making an individual plant. The pots can be placed outside in summer but need to be kept inside in the warm in winter. Colocasia growing at Maui Nui Botanical Gardens, Maui, Hawaii. Photograph: Forest & Kim Starr, via Flickr. I am a sucker for a huge tropical houseplant, but I am not fond of the prices such houseplants usually command, so I thought I'd have a go at growing one for myself. Colocasia esculenta (one of several plants with the common name elephant's ear) is an edible grown in many parts of the world for its starchy, potato-like corm: you might know it as taro, eddoe or dasheen, among many other names. There's some confusion about the different names, but according to my copy of The New Oxford Book of Food Plants by JG Vaughan and GA Geissler these are all the same species. That said, like potatoes or other cultivated crops, there are lots and lots of different strains, all with their own characteristics and growing requirements It's also a popular garden plant and indoor plant, with its huge crinkled leaves on long stems that just shout 'look at me!' Eddoes are easy enough to buy in a good greengrocer or food market, so I got myself four corms and set about sprouting them. I consulted a book called Don't Throw It, Grow It for advice on how to get them started, and was pleased to see the method was very similar to my avocado stone sprouting method: wrap them in sphagnum moss and place in a plastic bag somewhere warm and dark. I try this method for three of my corms, and place the other one in houseplant compost to see how that technique compares. I don't know exactly what kind of Colocasia I will end up with, but that's part of the fun! There's a great PDF guide to growing Colocasias here courtesy of Garden Organic. I have no ida if I will be able to grow anything harvestable from my eddoes, but it will be fun trying! If you do manage to get a crop, remember to cook the corms first as they contain calcium oxalate when raw, which is not good for your kidneys. If you're not the kind of person who likes surprises, or you want to get hold of one of the more choice Colocasia cultivars, there's no shame in that either. There's a roundup of Colocasia cultivars at the bottom of this piece in Horticulture Week. And where to buy colocasia corms? In the UK, your options are limited - try Thompson & Morgan who sell 'Black Magic' although it is currently out of stock; I also stumbled across a Scottish selling site called Himalayan Gardens which has a nice stock of Caladiums, Colocasias and so on, although they only have two Colocasias in stock as I type: also worth trying Palms & Exotics who seem to have a good range. I haven't used either of these companes before so can't vouch for them. In the US there are more options, including plantdelights.com, Logees and elephantearsplants.com. Let me know where you buy your Colocasias! Colocasias have been bred into all kinds of gorgeous cultivars, like this C. 'White Lava', with Ipomoea batatas ‘Sweet Heart Purple’ on the left. Pictured at the Conservatory Garden in Central Park New York. Photograph: cultivar413 via Flickr. If you want to learn more about how to grow microgreens, do have a listen to an early epsiode of On The Ledge, the Microgreens episode. But I wanted to remind you about my two favourite seeds to sow in bulk, fenugreek (aka methi) and coriander. It's so simple to do - just soak your seeds in water for a few hours before sowing thickly onto a thin 2cm or so layer of seed compost (if you don't have seed compost just run normal compost through an old sieve to make it finer). Do not cover the seed with more compost, just top the tray with a layer or two of damp newspaper which you remove as soon as the seeds germinate and snip off your harvest around two weeks after sowing. get into the habit of sowing regularly and you should end up with an ongoing supply of fresh greens, ideal for adding to sandwiches, salads, topping stir fries and curies. You can do a similar thing with dried peas from the supermarket - just look for whole dried marrowfat peas, they are usually sold in a box here in the UK. Soak overnight before sowing 1cm deep in seed compost: you should have your first shoots within a couple of weeks, and unlike the microgreens if you snip from off just above the first pair of leaves, you should get a couple of harvests at least out of them before they run out of steam. Lindsey from Idaho wanted to know what to do about the Sansevieria (aka snake plant) which has spent the last few years underlit and overwatered in her office. I suggested repotting in a gritty houseplant compost mix (add perlite, horticultural grit or even dust free cat litter, about a third to a half of the overall mix) in the same size pot and gradually moving to a brighter spot. That should help new roots grow without shocking the plant. This week's show featured Roll Jordan Roll by the Joy Drops, An Instrument the Boy Called Happy Day Gokarna and A Man Plays Trekking Song on Fewa Lake by Samuel Corwin, and Overthrown by Josh Woodward, all licensed under Creative Commons.